I’ve already made some changes to my NoNeed4Green, so here is version 2. The main addition being the facility to add foreground pictures. The foreground pictures have their own sub-folder called foreground and they use PNG files only, as you need images with transparent backgrounds for it to work. 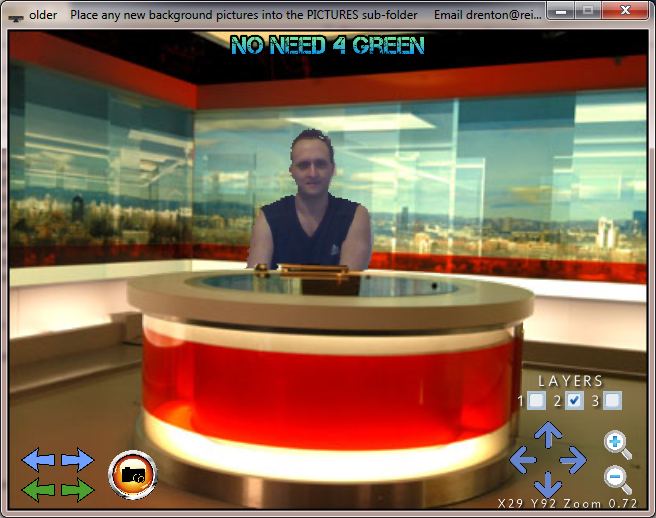 This allows you to put objects in front of the live cut-outs of people as well as having a background behind them. This lets you do things like putting someone behind the desk of the oval office or behind the desk of the BBC newsroom or on the bow of the Titanic. You can also now resize and move all 3 layers. Layer 1 is the background, layer 2 is the live cut-outs of people, while layer 3 are the foreground objects. H toggles between hiding all on-screen buttons and revealing them. Keys 1,2,3 select layers 1,2 and 3 to allow you to move and resize them. Here is a video demonstrating how it works. Download it from the link below, unzip it and double-click on the .EXE file to run it. You require Windows 7 or Windows 8, XNA4 runtime and Kinect SDK 1.7 installed. Click here to download No Need 4 Green version 2 in zip format. Click here to download No Need 4 Green version 2 with C# source code in zip format. Looks great, really impressive. What license are you putting on this ? Thank you for open source. Install xna4 + kinect sdk1.7 and your problems will be solved.